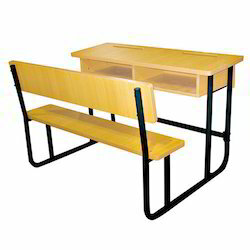 Specification : Two Seater Desk and Benches for preprimary section. Seat Height: Upto 1 ft.
We are one of the best organizations in the market, involved in offering a wide collection of School Desk with Benchto the customers. These products are made from high quality components at very reasonable prices. Owing to the support of our well-equipped manufacturing unit, we have been able to provide an excellent quality gamut of School Desk that is designed by our talented professionals. Durable metal is used to make frame of these School Desk. Light weighted these desks are durable and made of crack proof wood that is termite resistant. In addition to this, these desks are thick in frame and safe from damage by adverse conditions. Besides this, these products are safe to use up to many years. We are engaged in offering School Desks to our esteemed clients. Designed and made by skilled carpenters, our range is perfect blend of functionality and durability. Demanded in schools, colleges and educational institutions, our products can be customized as per specific demands of the clients. Owing to the vast familiarity, our firm is proficient to present Combined Desk and Bench toour clientele. Our customers can buy this product as per their necessities. Backed by our prosperous industry acquaintance, we present a comprehensive series of School Desk Bench. This product is available in diverse sizes and designs that meet on customer’s demand.